Tiffany Manor, Newark’s best kept secret, is a building rich with history. In June of 1887, a local newspaper headline announced the completion of Tiffany and Company’s silver plate jewelry factory in Newark, New Jersey. On this site, Tiffany’s founder, Louis Comfort Tiffany, not only revolutionized past methods of manufacturing, but also created an architectural gem. It took six years to complete this magnificent Romanesque style structure with 24-inch thick exterior walls of red brick and brownstone. 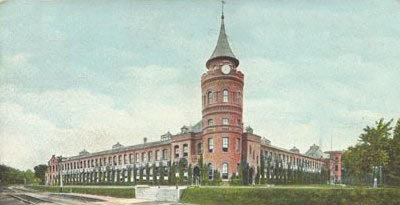 With its turreted towers, ornamental brickwork and interior courtyard, the factory became a famous city landmark. The cost was $100,000 a considerable sum a century ago, attesting to quality and elegance for which the Tiffany name is still famous today. Today, Tiffany Manor has been transformed into luxury apartments. As a gated community and surrounded by the park, there is only one entrance and exit in and out of the property assuring for safe and sound living. With several different floor plans offering anything from a duplex, to flats to tower apartments there is an apartment suited for every individual or family. Public transportation can be conveniently found in close proximity to Tiffany Manor. With Newark’s Penn Station, NJ Transit and Newark Liberty Airport located within miles of the complex, public transportation is always easily accessible.